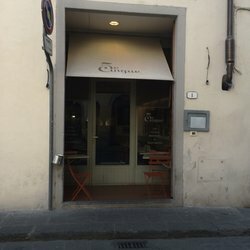 Located on Via dello Sprone, one block away from Via Maggio and one block away from Piazza Pitti,5 e Cinque is in a calm quiet square, giving the customer a break from the busy Piazza Pitti without going too far. Although the restaurant is tiny, finding the restaurant was very easy. Upon entering, I was quickly greeted by the waitress and seated without waiting. I did not make a reservation but making a reservation would be a good idea. I went in at lunch time and only one table was free, the rest of the restaurant was packed. The restaurant is very tiny which makes it a good idea to make a reservation beforehand. The restaurant was no bigger than a room, with enough space for only a few tables (around 8). Upon walking in, I could automatically feel the friendly/laid-back vibe. The light colors of the walls and few pastel colors around the room were very pleasant to the eye. The room was covered with just enough pictures to make the room still feel spacious rather than cluttered. Towards the back of the restaurant was a wine bar with lots of wines on display on the walls. It showed the customers the assortment of organic wines that the restaurant has to offer. All the customers seemed to be satisfied with the restaurant because they were all engaged in conversation and with their food. They only had their menu in Italian and no English copies. This is because they change the menu every day but it was not a problem because the waitress was willing to suggest a meal for me. The service in the restaurant was very fast. I was seating immediately and the food was brought out very quickly. The waitress was very polite and very helpful in helping me pick out my dish. The waitress was very attentive to me and the other customers, constantly coming over and seeing if I needed any help. The dish that I had was Riso Carnaroli con Porri, Zafferano e Parmigiano, which means Carnaroli rice with leeks, saffron and Parmesan. The menu was only one page long and it was only in Italian because they change the menu every day. There were antipasti, primi, and dolci with an assortment of wines as well. The average cost of a dish was 10 euros. The dish that I had was Riso Carnaroli con Porri, Zafferano e Parmigiano which means Carnaroli rice with leeks, saffron and Parmesan. The Parmesan tied the rice and vegetables together very well. At first it looked like there was too much cheese but it was just the right amount. What surprised me most was how full I was after the meal because the dish did not look big at all. Also, not being a vegetarian, I did not think that vegetarian dishes could fill you up so well. I felt full and satisfied after eating the Riso Carnaroli. Other dishes that the restaurant served that day were: basmati rice with broccoli and olives, scalloped onions, fried eggs with tomato or cheese or Lebanese. As a non-vegetarian, I would recommend this restaurant to everyone, vegetarians and non-vegetarians as well. It was a nice change eating fresh, locally grown food and not eating pasta, pizza or panini which are sold all over Firenze. Some may argue that this restaurant is not Italian but it is real Italian food because this food was grown fresh and locally in Tuscany. This entry was posted on Friday, November 13th, 2015 at 2:58 pm. It is filed under Florentine Foodie. You can follow any responses to this entry through the RSS 2.0 feed.